To fold means ‘to bend something over itself,’ like cloth or paper. To fold also means ‘to cross, to put one over the other,’ when talking about a person’s arms. Fold is also a synonym for wrap and it means ‘to embrace’ as well. Informally, in reference to a show, to fold means ‘to close or bring to an end,’ and it also means ‘to fail in business’ and ‘to give in.’ As a noun, a fold is a layer of something or a line made on something by folding. Another meaning for the noun fold is ‘a pen where animals are kept,’ especially sheep. This meaning extended to mean the group of animals kept in a pen, and is often used figuratively about groups of people, such as religious congregations. Can you give me a hand to fold the clean laundry? Lisa folded her arms and looked stern. Eugene folded the necklace he had found in his handkerchief to protect it before putting it in his pocket. The mother folded her child in her arms. The show is due to fold next week. The restaurant folded in its first year. Alison was determined to get her way, so Karen folded in the end. Dan washed the herbs then dried them between several folds of kitchen towel. 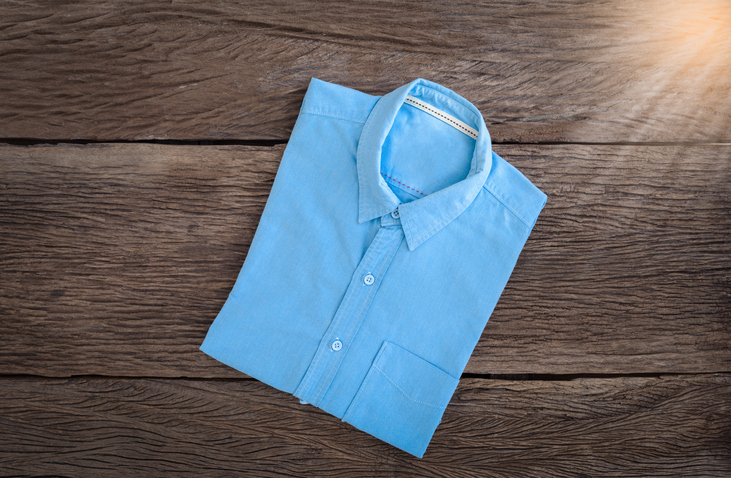 Folding clothes can be a real chore, but here at Word of the Day, we’ve found a short video showing you how to fold shirts much more easily. You can use all the extra free time you will have to read more of our words of the day! Fold can also be used as a suffix meaning ‘multiplied that number of times.’ So if a business has seen a fourfold increase in profits on the previous year, that means it has made four times as much money. Fold is also used in the card game poker. If your hand of cards is too weak to win, in the betting round you would say, “I fold,” which means you withdraw from the game. Fold dates back to before the year 900. The Old English verb faldan (also fealdan in some dialects), later became either faldan or folden in Middle English, and meant ‘to fold something (usually cloth) onto itself.’ It can be traced back to the Proto-Germanic falthan or faldan, and is related to the German falten, the Dutch vouwen, the Old Norse falda, and the Gothic falþan, among others. All these Germanic words can be traced back to the Proto-Indo-European root pel-to- which is also the origin of the Latin verbs plicāre (to fold), and plectere (to plait or twine), the Greek pléko (to knit or plait), the Sanskrit noun putah (fold or pocket), the Albanian pale (fold), and even the English word plait (braid). The meaning ‘to give way or fail’ first appeared in the mid-13th century, while ‘yield to pressure’ is from the late 14th century. The noun, meaning ‘a layer of something folded,’ or ‘the line where something is folded’ dates back to the mid-13th century, and comes from the verb. The other meaning of the noun, ‘an enclosure for animals’ dates back to before the year 900, and is not related to the verb. The Old English falæd or falud has a Germanic origin, and is related to the Dutch vaalt (dunghill) and the Danish fold (pen for sheep), but its exact origin is unknown. It has been used figuratively since the 14th century. Finally, the suffix -fold also dates back to before the year 900, as the Old English -feald, and later the Middle English –fald or –fold. It may come from the verb, but it is just as likely that it evolved separately from the same root. It is related to the Dutch -voud, and the German –falt, and more distantly related to the Greek –paltos and –plos, and the Latin –plus.